Since I’m not really in an “official” lock-up period at the moment, I have been kind of playing around a little bit with another option which I had gone ahead and ordered with the Queen’s Keep even though I wasn’t sure if it would ever get used or not. That is the “anti-pullout” option. Pulling (or even “falling”) out of a chastity device has never been a particularly big problem for me but I can see how it might get pretty close sometimes. I can think of maybe ONE time, early on, when I may have actually slipped all the way out of one of the larger CB-XXXX devices, but that hasn’t happened at all since using better fitting devices. So why buy that option now? Honestly I can’t really say for sure what was going through my mind when I made that decision. I guess mainly it was just that if I’m paying for a custom device anyway I may as well get some of the bells and whistles with it up front, rather than deciding later that I want it and have to go through a hassle of sending everything back to be re-done. In general, I think if a chastity device is sized right and is small enough, it would be very difficult (but maybe not totally impossible) to actually pull yourself out of it. That being said though, mine fits pretty darn well but there are occasions when I see that I have still shrunk pretty significantly within the cage. And at that point if I really wanted to try and give it a little tug out the back… it just might be possible! Why anyone would ever WANT to do that, I have no idea! The balls would still be trapped between the cage and base ring, so essentially you’d end up with this hunk of steel hanging down very uncomfortably, and I’m quite sure it WOULD be impossible to ever squeeze back into the cage then! Personally, I would hate having to go to Angel asking for the keys in order to “fix” that type of situation. As much as I’ve been trying to have her take MORE control over my chastity status, it would be very difficult to explain why suddenly I was trying to get out, without involving her.. No thank you! So anyway, back to the “anti-pullout” option that Mature Metal offers with most of their devices. Basically there is a small plate with a hole in the middle of it, at the top rear of the cage. There are several options of different “pins” that you can stick through this hole, and it is held in place by the locking post of the base ring. There are three different styles of pins (blunt, pointed, or a criss-cross pattern) which are all available as short, medium, or long lengths. Ordering this option includes three pins to start with. I’m not particularly into a lot of “pain,” so figured the blunt ones would be the safest bet. 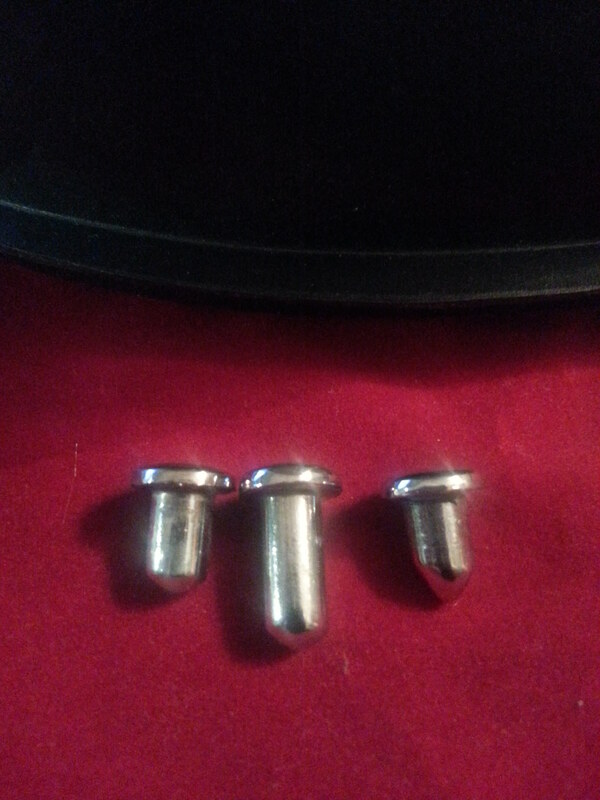 I decided on the short and medium sized blunt pins but still had one to go. I really didn’t think I would probably like the length of the longest pin, taking up that much space inside the cage, so for kicks I opted for the short pointed pin instead. This past week, I started playing around a bit with the short blunt pin. When putting it in place I was already completely filling up the cage, so I was worried that it would be very uncomfortable having this thing forcing its way in. But surprisingly, I could hardly tell it was there at all! I’ve tested this one out for a few hours at a time, and even all day at work once. I can say that even when I start to get a little bit hard (not that this really happens at work regularly! Lol) it isn’t painful in the least. It would remain to be seen if that would change during an intense “teasing” session! 🙂 It DOES look like it does its job though and keeps everything kind of pushed down towards the end of the cage. What I’m still not sure of, is at the times when I have truly shrunk to my “smallest,” if I might still be able to slip underneath that pin?? I may venture a bit further and see what the longer blunt pin does, but that pointed one kind of scares me a little! I think that one might hurt, but at least I have it to TRY some day if ever brave enough! The more i look at that queens keep the more i like it. We are about to order one in a couple weeks. The current one is OK but a but to long. With to many moving parts that pinch and cause discomfort. Then add the plastic tube to help against the hinge chaffing and pinching. I kinda hate it yet love the feel of the chastity itself. Good luck! As I’ve said before, the smaller (shorter) the better. I suspect you’ll see a huge difference from the plastic devices, as I did! Mine isnt plastic. Yet the base ring is hinged to help get it on. I think it was called asylum, small with urethral tube. Ah, ok- I’m not familiar with that one. I would think a urethral tube would really start hurting after a while, wouldn’t it? And the hinged base rings do tend to cause issues… Lots of places to pinch! I did have one of those on a plastic device once, before they went to a little different design. I’m very new to being locked and I feel like I should try and go down a ring size to make it less tempting to pull out. So far, I haven’t wanted to even try but I have no idea just how far my Lady might decide push me now that I’ve handed over complete control. I did attempt the smaller ring and circulation was alright and I enjoyed the snug fit but woke up in the middle of the night with one hell of a burning behind my scrotum. I had to tap out and my wife unlocked me. In the morning, I went back to the large ring. Hmm, can’t say I’ve ever felt a “burning.” That doesn’t sound pleasant! Generally speaking I’ve always felt that the smallest ring that can be worn comfortably is the way to go. If you weren’t having any other circulation issues, it may be worth trying again to see if that was just a fluke. I’d suggest putting some kind of lotion/lube back there behind that ring at least the first night, to see if it makes any difference!